One of the practices that has guided my decisions, prayers and focus each year is choosing a word for the year. Actually, the word choses me – it keeps nipping at my heart, reoccurring in messages and in stories, unfolds in my thoughts. I have written about this practice in the past and have included resources so I won’t repeat all the instructions here but share my previous posts about this valuable practice. I encourage you to take the time to read these, especially if this is new for you. Pray – ask God to show you the quality that He wants to mature in you. Or the word that He wants to transform your life with. I brainstorm a list of 10-15 possibilities. Then watch for one to keep nagging at my heart or reappearing in what I read or hear. Watch for common themes. Narrow down your list to the top three and look up definitions of these top three. Pray again. Don’t over think this process. Just lean into the experience. Choose one that resonates with you. Does one excite you? Invite you closer to God? Keep this one word in front of you throughout the year. Ask yourself periodically how this word is shaping your life. What is God inviting you to do with this word? Abbey of the Arts offers a free online course that I have taken several times to help me in discovering my word. I want to live each day knowing God is enough. 2. I want to live each day remembering I am enough. I struggle too often with feeling I am not good enough. We are all beloved children of God – created by him, for him and we are enough. 3. I want to live each life grateful for having enough. So many in the world live without food, clean water, safe homes. Our society screams at us all the time to buy more, be more, compare ourselves to others and what we don’t possess. I choose to be thankful for all God has given me and that is enough. Let me know what word you chose for the year and let’s encourage each other to connect closer to God in 2018 through his Word. I was surprised by my word of the year this year. Overflow. God is good! Overflow? wow that is a cool word and one I haven’t heard much. I love the imagery it creates and movement too. May 2018 overflow with blessings for you, Therese! 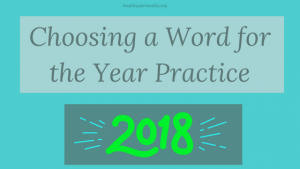 Jean, this is a great list of resources and I like your process–pray–twice!–for choosing a word for the year. I agree, the Holy Spirit usually nudges me with gentle whispers….especially when I’m open to hear him. The words seem to choose me, not the other way around. My word for the year? “Listen”–which fits well with some decisions I made recently. Doesn’t God always know? Happy New Year to you! Listen is a great word – bursting with possibilities and lessons. I know just what you mean about the word choosing us. hard to explain to others but it often happens than way. Happy New Year to you too. Listen is a great word, Jody and I know will take you into new arenas of life and love. Happy New Year to you too. I have already been seeing how the word enough will weave its way in my life. Just stopping and reminding myself I have enough is great for impulse purchases. LOL. But knowing and living with the knowledge that God is enough is such a blessing – what an amazing God we have! I am so grateful. Glad you liked the resources. This is a favorite practice of mine that gives me insight and framework to my year. New year blessings, Nancy! What a great word choice, Jean! 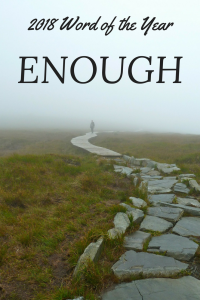 I’ll look forward to seeing how God will work through “enough” this year. Both for you AND for us through you. Been praying about that word too. I reviewed my journal just today for all my entries form 2017 and amazed how my 2017 word weaved itself throughout the year and I didn’t noticed some of the times. God is so good. blesses us at the moment and then in reflection too. Happy new year, Lisa! Enough . . . That is a perfect word, Jean! Definitely something we need to remind ourselves – we are enough in God’s eyes. My word for the year? I will reveal that in January. Sorry to keep you waiting, my friend!